First off, don’t buy into this at all. This is what happens when the first blockbuster deal of the offseason takes place. The trade happens, and then boom – every team looking for roster help/salary relief is looking to spin a major multi-player deal. But this idea may actually have some merit. In an article by Ken Rosenthal of Fox Sports, Ken states that rival execuitves believe the Royals have a line of suitors if and when they’re ready to pull the trigger on a potential trade. Dayton Moore’s contract expires after the 2014 season. Now although he likely is far, far away from being on the dreaded hot seat, we’re entering year seven of “The Process”. There is no doubt that this organization is in tremendously better shape than when he took over in 2006. The farm system has bascially completed a worst-to-first turn around and his aggressive draft approach is beginning to bear fruit at the big league level. But his trade history has been disastrous and his prized free-agent acquisitions (Gil Meche, Jose Guillen) haven’t panned out like the team has wished. On the other hand, he has shown a legitimate knack for signing low-cost, high-reward free agents (Rick Ankiel, Kyle Farnsworth, Scott Podsednik, Jonathan Broxton) who he has been able to flip for multiple parts (Melky Cabrera and Jeff Francoeur being the most notable exceptions). The time for Dayton’s work in the office to translate into wins on the field is here, and his window could be closing – albeit it slowly. 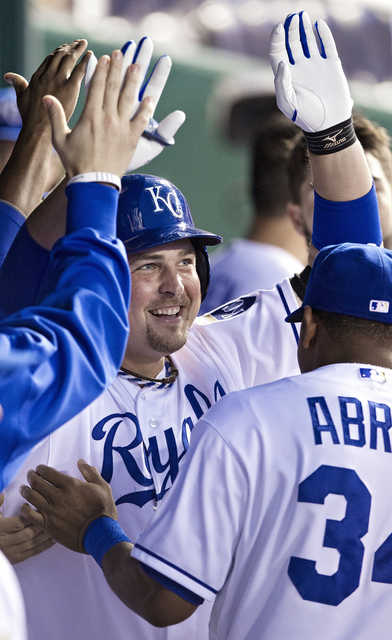 Rosenthal notes that the Seattle Mariners “covet” DH/1B Billy Butler. The Mariners possess one of baseball’s top collections of minor league starting pitchers: RHPs Taijuan Walker (age 20, AA) and LHPs Danny Hultzen (age 22, AAA) and James Paxton (age 24, AA) – the latter of whom the Royals have been reportedly scouting in the Arizona Fall League. Prior to the 2012 season, Baseball America cited all three of them within the Mariners top 10 organizational prospects (1. Walker; 3. Hultzen; 4. Paxton). Billy is coming off a season where he had a career high in homeruns and RBI and has been the Royals’ most consistent offensive performer since his arrival back in 2007. If the Royals were to surrender Butler in a deal, it has to work out. Eric Hosmer suffered through a miserable sophomore slump. Alex Gordon got off to a terrible start before finishing strong. Mike Moustakas had streaks of greatness to go along with numerous cold streaks. Salvador Perez, though impressive, has yet to show he can hit at a high level for an entire season. Lorenzo Cain showed flashes of pull-power but couldn’t manage to stay healthy. Alcides Escobar could be a reliable no.2 hitter. Jeff Francoeur is inept and may be out of a job. Will Myers is unproven. And whoever takes the second base job will likely hit in the bottom-third of the order. All in all, giving up Butler creates some real instability in a lineup that, for the most part, has a lot to prove in 2013. But the DH position can be filled with low-cost platoon options like the A’s (platoon of Johnny Gomes and Seth Smith) and Yankees did (Raul Ibanez, Alex Rodriguez, Eric Chavez, Andruw Jones). But is acquiring unproven starting pitching really in the best interest of the Royals? Afterall, the organization is full of young pitching talent that has yet to see anything above Triple-A level talent. If the Royals were going to deal Big Bill to the M’s, they would have to acquire someone along the lines of Jason Vargas in the deal – clearly not a centerpiece player to any deal involving Billy Butler, but would definitely help the team for 2013 and beyond – along with at least one of their top, big league ready pitching prospects. In other rumors, the Tampa Bay Rays really like OF Wil Myers. Although I am no proponent for it, trading Wil Myers+other prospects would definitely land the top-of-the-rotation guy the Royals are looking for. And the Rays definitely have a number of arms the could be open to dealing. Names like James Shields, Jeremy Hellickson, Matt Moore, and even 2012 Cy Young award winner David Price have been mentioned before when it comes to potential trades with the Royals. In my mind, if the Rays offer you any one of these names in a potential deal, no matter who you have to give up outside of Sal Perez, you make the deal. Corner outfielders can be replaced, but finding a dependable top of the line starting pitcher is like winning the lottery. On your birthday. Don’t get me wrong. 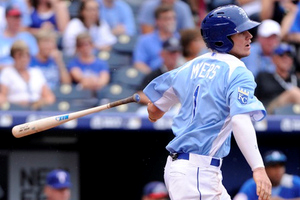 Wil Myers may be the best hitter to come out of the Hosmer/Moustakas/Myers trio. But if you have the chance to land any one of these guys, Dayton Moore is obligated to pull the trigger. Ask anyone around baseball and they’ll tell you that all the Royals need to compete in the AL Central is competent starting pitching. Ken also notes that the Astros could be a potential trade partner for the Royals when it comes to starting pitching, noting that they could possibly be willing to part with either Bud Norris or Lucas Harrell. On their end, the Royals would likely have to give up a few prospects, but nothing of great significance. Out of these three scenarios, I would personally like to see a deal with the Rays happen. The Royals would have to give up their uber-prospect in Myers, but you can’t put a price on quality starting pitching. The small market Rays are in a very unique situation: they have four potential no. 1 starters in their rotation whose salaries will increase as they years go by, top prospects in Chris Archer and Alex Cobb waiting in the wings should a spot open up, and a sever lack of impact hitters outside of Evan Longoria and Ben Zobrist. Say the Royals part with Myers + Giavotella/Colon + pitching prospect for any one of Price, Hellickson, Moore, or Shields (preferably in that order), do you think that would be enough to get a deal done? Jason Vargas can become a free agent after the 2013 season. Seattle fan here. There has been a lot of chatter over in the Seattle bloggosphere on this topic. What does the KC world think the real cost of a Butler deal would be? A lot of people think they would that all they have to do is throw Paxton, Franklin and a couple of lesser prospects your way to get a deal done. A local sports writer suggested that the M’s would need to send Vargas to balance the contracts in addition to Paxton, Franklin, plus. I personally like the idea of sending Ackley, Carp, Montero and what ever to Tampa, the Rays sending Hellickson to KC and the M’s getting Butler. Just my thoughts. If you are a Mariner fan why would you want to trade ackley! Ackley is a awsome defensive shortstop and he can be are lead off hitter in the future! I don’t mind giving up carp and Montero for Butler but not ackley! I think you mean second baseman, not shortstop. Butler is going to cost more than Carp and Montero. I’m a Mariner fan. The names on the back will come and go. The name on the front stays the same. If the M’s could get Butler for Franklin/Carp/Montero then great. But a quality SP is going to cost more. I like Ackley a ton, but he’s replacable in Franklin and Romero. Going from Ackley and Montero to Butler and Romero/Franklin I believe is an improvement. Myers + Giavotella/Colon + pitching prospect for Hellickson?? Sure, as long as TB throws in Archer and Cobb. You’re way overrating Shields as well. Cain+ will soon be sent to Atlanta for Jurrjens (just before Atlanta is set no non-tender him)…….then Moore will be off the “hot-seat” and hopefully in the fire. I think you may be overvauling some players as well. Albeit slightly unfair, Giavotella hasn’t shown much in his 376 PA. Christian Colon isn’t considered much more than a utility infielder to many around baseball. What evidence do you have that Moore will send Cain to Atlanta? I know his trade history isn’t sparkling, but give the guy some credit. He knows Dyson isn’t the answer in CF and Wil Myers shouldn’t take that position over. The Royals would not trade Butler only to acquire Hellickson. If they would get say Paxton (or Vargas) with Hellickson, they might be willing. I think Vargas, Paxton, and Franklin would be a nice start. Vargas would been an immediate upgrade over many of the Royals’ in-house candidates such Hochevar and Mendoza. Acquiring young, controllable, major league ready top-tier pitching is the key to the trade however. Given how close Paxton is to being major league ready, he could be the key to the whole trade. Nick Franklin would be a nice throw-in prospect, especially if he focuses more on 2B. In my opinion, if the Royals and M’s do try to work something out, Vargas AND one of Paxton, Walker, or Hultzen have to be involved. I agree, Moore has the potential to be an ace. I based my judgment more off the fact that the Royals already have a bevy of young left-handed pitchers like Danny Duffy, John Lamb, Mike Montgomery, Will Smith, Chris Dwyer, Justin Marks, etc. That being said, I would be ecstatic if the Royals acquired Moore or Hellickson. To me, Hellickson is just more realistic. Royals fan here. I love Butler, but if Seattle is willing to send Vargas, Franklin, and one of Walker/Paxton/Hultzen for him, I think the Royals have to pull the trigger. I dont see the Royals making a big splash via trade. Especially when it comes to the Rays pitchers. All of the above mentioned names, maybe minus Hellickson will very shortly be demanding and recieving Contracts of close to 20 million annually.. Price and Shiels sooner rather than later. Cant and Done see it happening. Royals arent that far off from competing with the team they have. Stay inhouse and try to make it work. If it doesnt a year or two from now. Pull the trigger on some minor moves and hope for the best. Any trade for more pitching prospects is naive at best and plain stupid at worst. The Royals already have 25 pitchers including at least 10 “prospects” on the 40 man roster. At some point, Moore must stop living off minor league accolades and start fixing the parent club. I also question the Royals improvement under Moore’s tenure. They have gone 62-100, 69-93, 75-87, 65-97, 67-95, 71-91 and 72-90 in those years. Only once have they achieved less than 90 losses in those 7 years and that was 5 years ago. Trading Butler is a mistake. A year ago maybe, but not now. I agree, there are DH options but will any hit 30 HR and drive in 100 runs? The three players that must be used to bring an A or B grade pitcher are Cain, Myers and yes, Hosmer. Hosmer’s home is in Florida and Tampa needs a 1st baseman. And they have starters to spare including Hellickson, Price or Moore. Also Hosmer is the easiest to replace either with Butler or a veteran like Hafner, Youklis or Berkman. I think Moore is on the hot seat for his poor trade and free agent performance and for sticking with Yost far longer than he should have. Not to mention that the Chiefs dramatic fall won’t improve fan testiness come spring. The Royals better perform out of the box in April or it is highly likely both Moore and Yost will be shown the door. Many believe that would be a good thing. I don’t think any of these things will come to fruition. Except the Braves mention which I could see happening inexplicably. I am keeping my fingers crossed that the Braves fill their CF position before it comes to that. We have just been hearing the same rumors for so long we want them to happen. I even think that for the most part they make sense, but if the respective GMs thought so it would be done by now. I think they do need something else, but I bet they go cautiously and wait to see where we are at the deadline. If I had my preference it would be Butler to Seattle for pitchers. I do think you can replace DHs, and could be helpful to the health of the rest of the players with pseudo days off. However if they wait and find themselves in a race they will have to target more of the Rays because prospects won’t really do anything for you in a chase. The Royals should trade Butler to the Orioles for Tillman, Arrieta and Betimit. Tillman has ace potential and Arrieta was the O’s opening day starter. Tillman finished strong and Arrieta didn’t but still has huge upside as a strike out pitcher, plus he’s a Missouri boy. Betimit was solid in Kc and could be used in a platoon DH role and back-up corner fielder. It’s a bit much for the O’s to give up for a DH, even though a very good one. Royals could throw in Luke Hochevar since they don’t really know what to do with him anyway. Betemit? I’m sorry, but the Royals would hang up the phone in a heart beat. If Dayton Moore accepted that deal, that would immediately be the worst trade in Royals history. The trade is not about Betemit it’s about Tillman for Butler. A 24 year old pitcher who went 9-3 with 2.93 era and 1.05 whip. making less than a half mil. and under team control for another 5 years. The Orioles and the Royals can score runs. The Orioles need more pitching, not more bats, just like the Royals. If KC does acquire another pitcher, I’d like to see it done soon and then non-tender Hoch. It’s time to admit that he’s a bust, especially after having worse career numbers than Kyle Davies. I also wouldn’t mind seeing Cain traded. David Robinson showed last year that he is a machine defensively when it comes to center field. He is also a low cost in-house option that has the potential to be a power hitter. With Cain’s history of being injury prone, the Royals need to sell high on him while they can. In summary, a blockbuster trade will help, but don’t get rid of the key pieces. Myers, Butler, Hoz, Gordon, Salvy, Moose and of course Esky must be in the lineup next year to provide the offense. Add D. Robinson and a power 2nd baseman and the roster is ready. Did you mean Derrick Robinson? The Royals just DFA’d both Clint and Derrick Robinson, meaning they’re both off the 40 man roster and are eligible to be taken by any team in the Rule 5 Draft. Yes, Derrick sorry. Not sure why I said David. But, if no team claims him in the Rule 5, i see him as an easy solution. I understand why they DFA’d who they did to protect their pitching prospects. Hopefully they can still keep ahold of guys like Robinson and Pena who can still prove to be an asset to the team either as a starter in Derrick’s case, or off the bench like Brayan Pena. Just realized I meant to say David Lough all along. Man, this lack of sleep from Black Friday had me looking like a dummy ha ha… But yes, Lough looked GREAT when he started last year for the team. And Lough is already on the 40 Man if I’m correct. Sorry again for the confusion of my posts.